The world’s most advanced RTG crane automation takes efficiency to a new level at Norway’s largest freight port. Over 125,000 containers are unloaded each year at the Port of Oslo in Norway. Together with a yearly throughput of one million tonnes of dry cargo, including grain, sand, cement and salt, the volumes are big – and will soon grow even bigger, with the Sjursøya Container Terminal in the South Harbour planning to increase container throughput from 210,000 to 450,000 TEU annually. As the Port of Oslo is located in a highly populated urban area, environmentally considerations were important issues in the evaluation process. Furthermore, expanding in a densely populated urban area posed a seemingly insurmountable challenge: how could the port double its capacity by 2030 without increasing traffic noise, pollution and energy consumption? 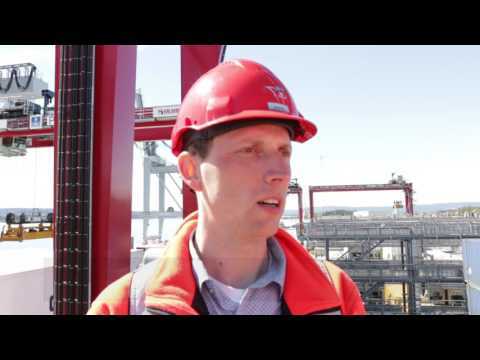 tyred gantry cranes (RTGs), making the Port of Oslo the world’s first terminal to deploy the sophisticated combination of automated positioning technology and process automation available to date. The port ordered its first RTGs from Kalmar in 2002 and was the first to adopt cable-fed RTGs. “The Port of Oslo is proud to be the first terminal to deploy this revolutionary technology in RTGs that makes our operations more sustainable, safer and quieter. Through these innovative features that Kalmar is delivering us, our RTG drivers will be among the most efficient RTG operators in the world,” says Svein Olav Lunde, Director of the Technical Department at the Port of Oslo. “Semi-automation offers us greater flexibility for the future, allowing us to take automation to the next level. We also pride ourselves on being the world’s most space-efficient terminal,” says Lunde. Choosing Kalmar Zero Emission RTGs over diesel-electric RTGs, CO2 emissions are reduced by over one million kilograms (>1,000,000kg) per year for the fleet of eight RTGs.